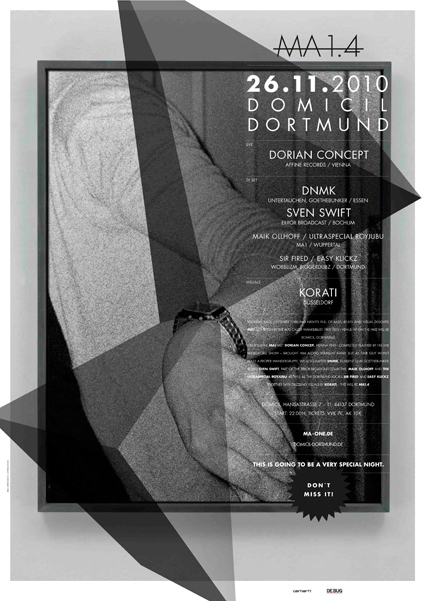 With Dorian Concept (picture above) the line-up features one of Austrias most promising new producers. The man from Vienna recently played a celebrated show during the Ninja Tune 20 years anniversary night at the Royal Albert Hall in London. To feel the energy of his funky experimental Hip Hop, Jazz, and Electronica fusion you have to see him live in a small club where the basslines are super heavy and the atmosphere sweaty. In Dortmund he plays together with Sven Swift of the Error Broadcast collective – another young producer that likes to rethink old Hip Hop traditions in a fresh and remarkable way.